The possibilities are endless when it comes to chazuke (茶漬け, ちゃづけ) which is popularly served as a light meal or snack throughout Japan. 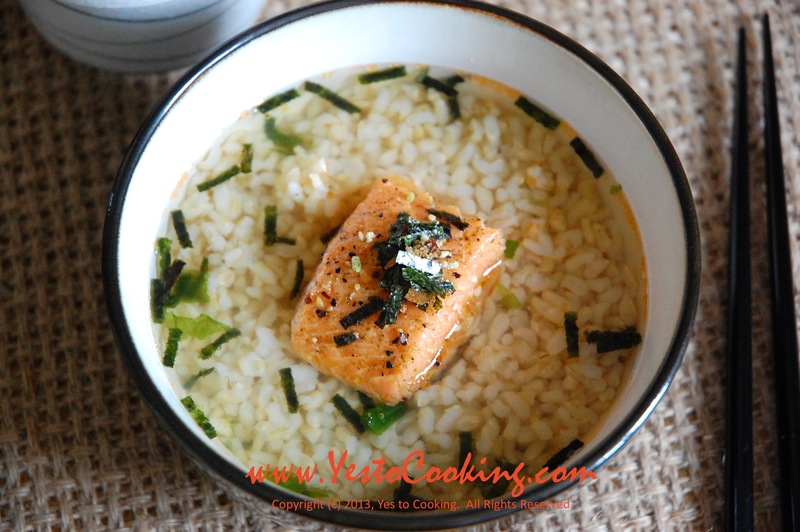 Oolong tea, green tea, or dashi is poured over rice that is served with savory toppings. This time, we’re using roasted smoked salmon and toasted nori for this quick-fix at home dish; however, feel free to add or substitute with pickled plums (umeboshi), fish roe (tarako), grilled shrimp, grilled eel, shiitake mushrooms, or toasted sesame seeds. 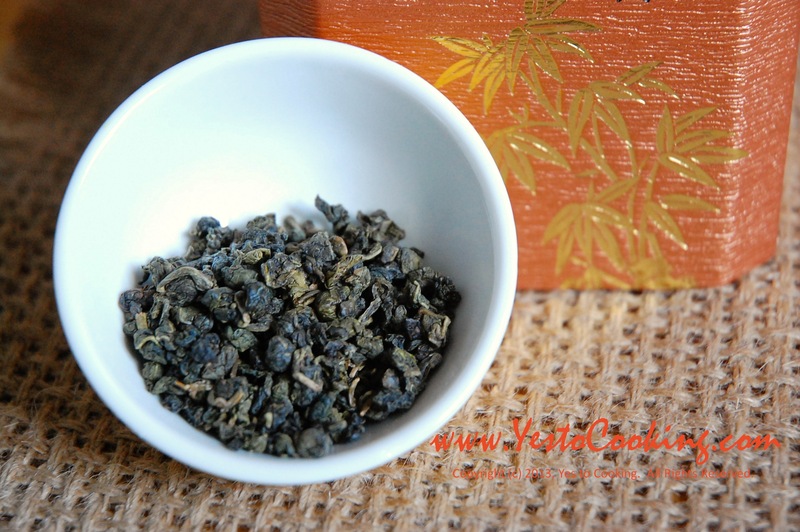 1) Wash tea leaves by pouring enough hot water to just cover tea leaves in a tea pot and then drain. Pour remaining hot water into tea pot and allow the tea to steep for 10 minutes. 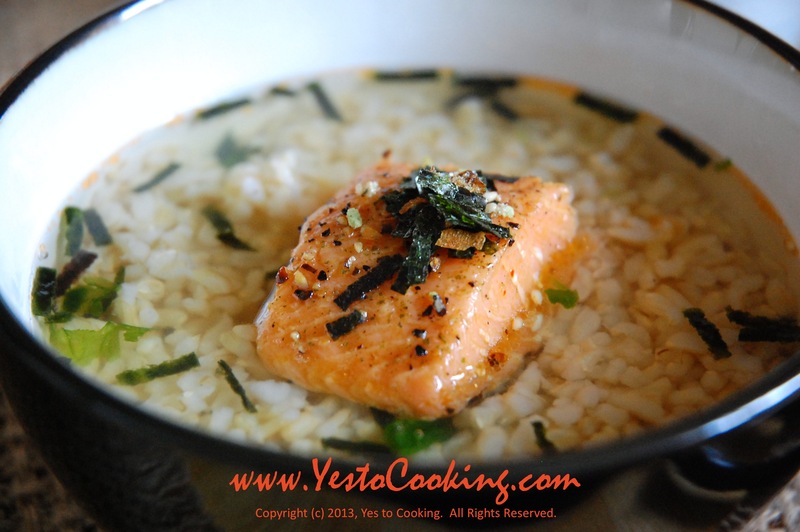 2) Place cooked brown rice in a bowl and top with roasted smoked salmon. 3) Carefully pour tea around the inside edge of the bowl to help topping keep its shape. 4) Sprinkle shredded nori and serve immediately. 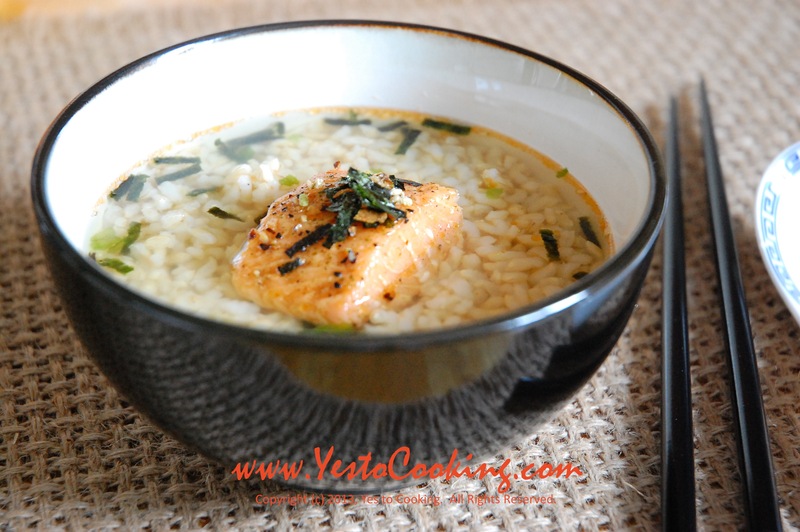 Tags: お茶漬け, ちゃづけ, chazuke savory toppings, chazuke toppings, cooking, 茶漬け, japanese tea rice, ochazuke, oolong tea rice, salmon rice recipe. Bookmark the permalink. You have brought cooking to the next level! I have seen something like that from an culinary book that is based on recipes from thousands of years in china. There is this dish made for the emperor. Oolong tea poured over rice crackers 锅巴 and boiled shrimp. Hi, I have nominated you for the The Illuminating Blogger Award and Beautiful Blogger Award! This is tempting to try n since it hot, don’t you think that unagi will suites with the dish??? Cold noodles are delicious for summertime! Are you referring to Kongguksu 콩국수 with the soy milk?